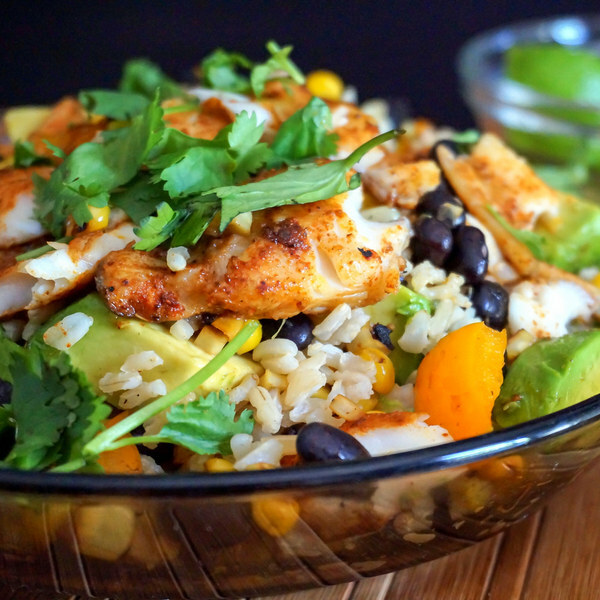 ← Fiesta Fish Taco Rice Bowl with Black Beans & Veggies. Using a strainer or colander, rinse the rice under cold, running water, then drain and transfer to a small saucepan. Season the rice with salt and add water; bring the mixture to a boil over high heat. Peel and mince garlic. Wash, seed, and small dice bell peppers. Remove husks and silks from corn. Hold vertically in the middle of a bowl and slice kernels off the cob. Once the liquid comes to a boil, stir the mixture, cover the saucepan, and reduce the heat to low. Cook the rice until the liquid is fully absorbed, 15 to 18 minutes. Once done, remove the rice from the heat and let it stand, still covered, for 5 minutes. In a small bowl, mix together chili powder, cumin, salt, and pepper. Rub fish with spice mixture. Coat bottom of skillet with oil. Add fish and cook until white and flaky, 2-3 minutes per side. Transfer to plate and set aside. Return skillet to stove. Add garlic and cook until fragrant, 15-30 seconds. Add bell peppers and corn and, stirring occasionally, cook until tender-crisp, 3-4 minutes. Drain and rinse black beans. Add to skillet and stir until heated through, about 1 minute. Wash and dry cilantro. Shave leaves off the stems; discard the stems and mince the leaves. Halve and pit avocados; scoop out and medium dice. Uncover the rice and fluff with a fork. To serve, place rice in a bowl and top with bean mixture and fish. Garnish with avocado, cilantro, and lime juice. Enjoy!